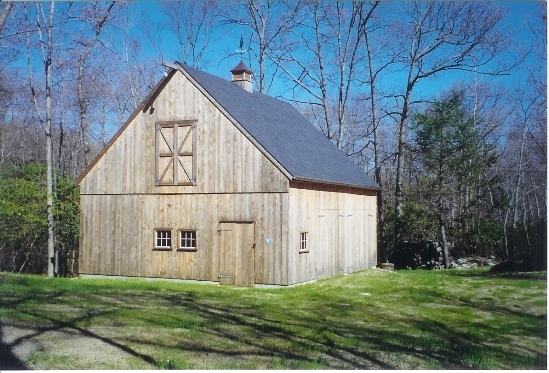 Built in 1997 the barn is 28' deep x 30' wide. 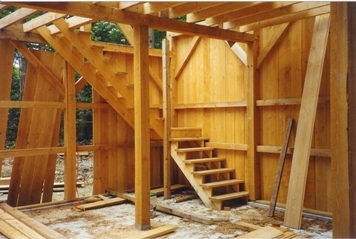 All post and beam, pegged construction using locally sawn hemlock and oak. She is on a poured foundation. She was designed and specked out by your webmaster on an inexpensive cadcam system. A proper place for a pretty boat. One guy, John, (his last name is classified) working by himself, built this barn. I offered to help but he politely refused saying he did not want me to hurt myself! 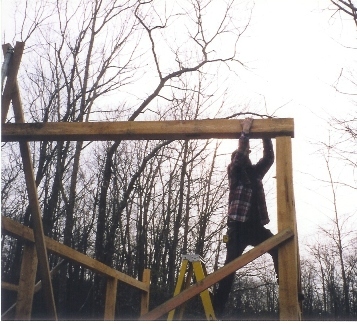 He used a portable gin pole to hoist the 6x6 and 6x8 main timbers, and all the rafters. It was really unbelievabe to watch him work. Here, he is going to set a pair of scissors which, with the gin pole, forms the tripod on which he will raise a large beam. See next photo.. This is how he did it. See the end of the gin pole in the upper left hand corner nested in the wood scissors? 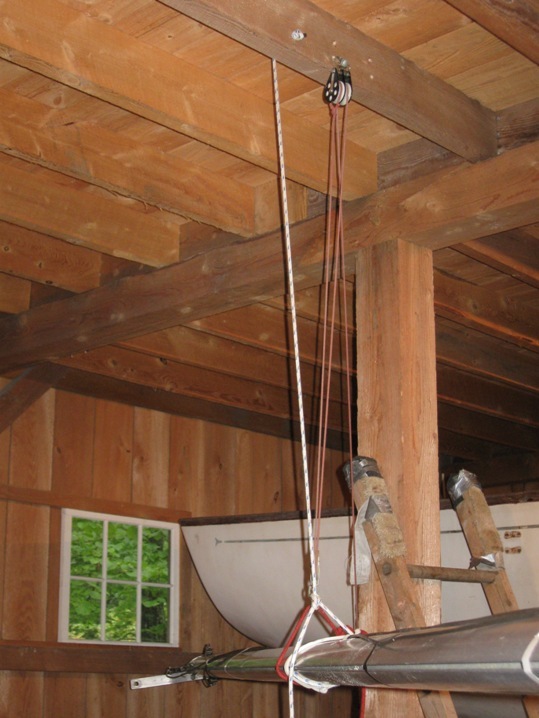 There is a line through the block at the top on the gin pole attached to the balance point of the beam. 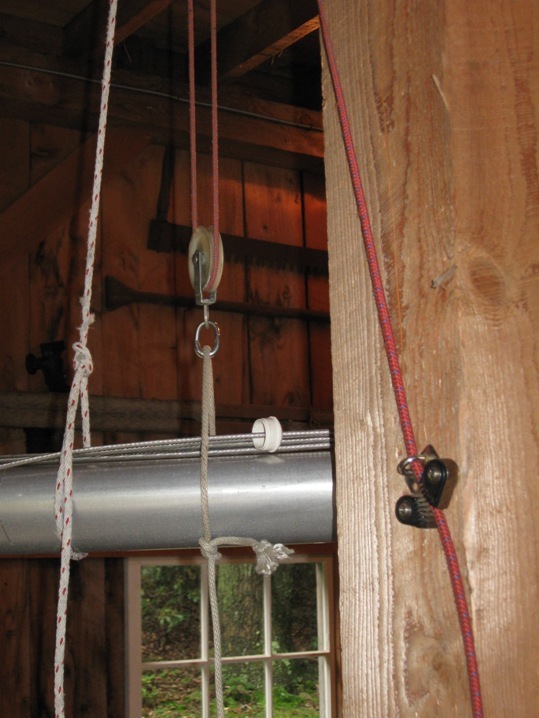 The vertical post at the right has a peg which will fit into the hole bored in the horizontal beam. What does this have to do with restoring and sailing our Dolphins? Everything. 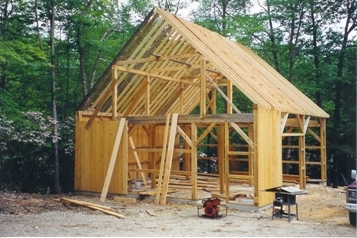 This is most of the external basic framing and roof rafters. The far bay has a 'third' door opening vertically so you have 10' height clearance. 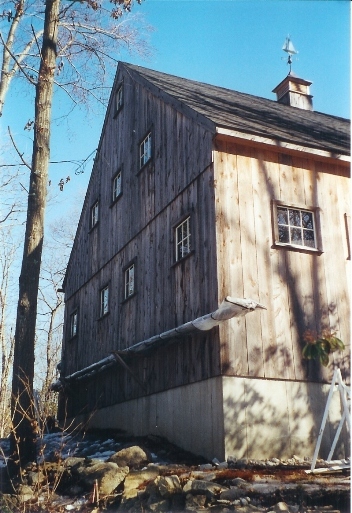 The field in which this barn is located is small which made positioning and size of the barn important. The overall length of the trailer with boat is 26'. Its snug but it works. There's enough room to sneak by on either end. It was a lot like trying to figure out the interior of a Dolphin - basically not enough room - plan carefully. Update July 27, 2014. This concept was successfully tested. Click here to go there.. This is deep winter and Marionette is hibernating. The inside height is 10'. If I had to do it again it would be 12'. Want to know what's under that blue tarp in the foreground? 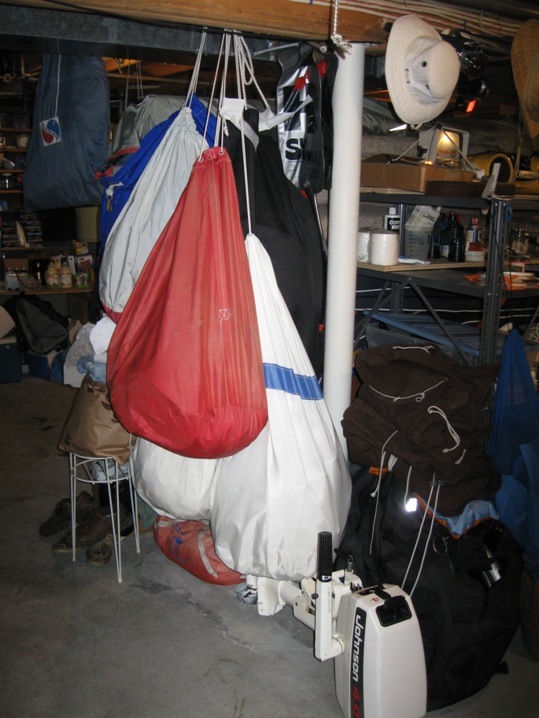 The ridgepole has a lobster pot block so you can lower your 42 lb dinghy through your workshop double doors to the ground floor . This was actually done - one could hope a photographer would be present. Nope.. The back side has some windows and a mast rack. Lest you worry that the top end of the mast is not properly supported, there is a special support post at the top end which likes to slip out when the photographer shows up. 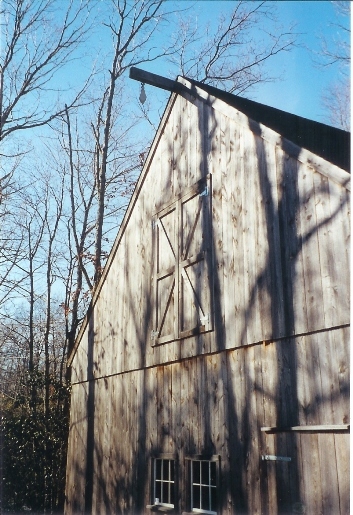 This is a good angle to see that the barn has a proper wind vane (purchased in Maine, of course) . Note: Masts are now stored inside. 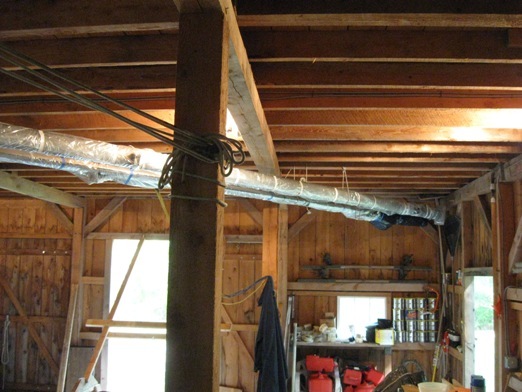 Storage - that's what barns are all about, right? liberally sprayed with WD40, tightly wrapped - no winter worries. 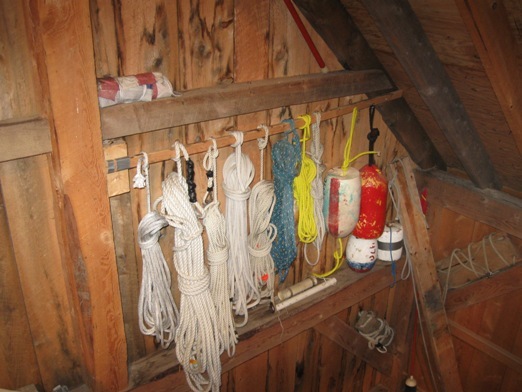 Booms and spinnaker poles are stored in the loft. This is the wall alongside the stairway up to the workshop. Very neat don't you think? Once, lying full length on that beam in back of the lines and floats, was a 5' black snake!! Circulating this story is a very effective way to keep control of visiters who don't fully understand boats, barns, and stuff like that. You'll notice the fender board and its black marks - lying along a fixed dock piling with Maine's 10-12' tides will test your fenderboard. And notice two, that's 2, bosun's chairs tucked in against the wall. I haven't been up in one of those in 20 years!! 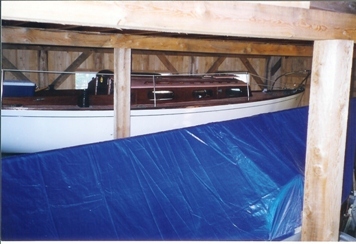 A partial view under the stairs - those blue bags are Rode Bags with a designed hole in the bottom through which you tie off the dead end. I got them for nothing somewhere. They each have 150' of 1/2' nylon line with 10' of 1/4 chain sitting on top. There's a NEW! 35lb CQR just out of sight that I got from Defender's for $75!! - just waiting for that special hurricane. 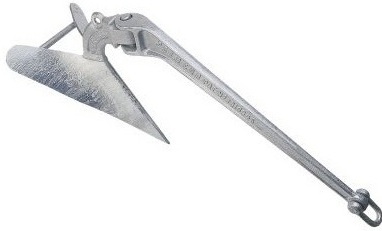 When we do have a hurricane I go up the Niantic River into a hurricane hole and use my 20 lb hi tensile Danforth. It digs in so deep I can just barely get it up after the event. I am thinking I might use the CQR and some heavy chain as a mooring somewhere.. 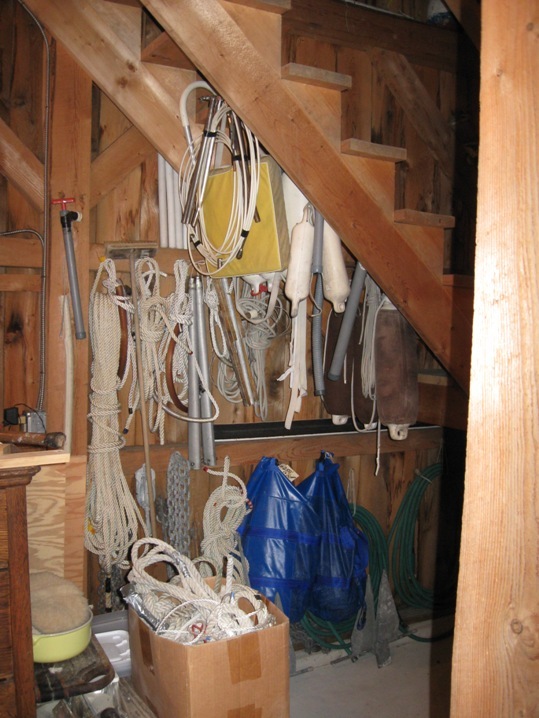 I like hanging sail bags - a cellar floor is a brutal way to treat these things. I've got a folding bike here I last used up in Maine in 2003. My most valuable mechanical accessory is this 12 yr old, 32lb Johnson 4hp motor - if I can keep water out of the gas she never fails. 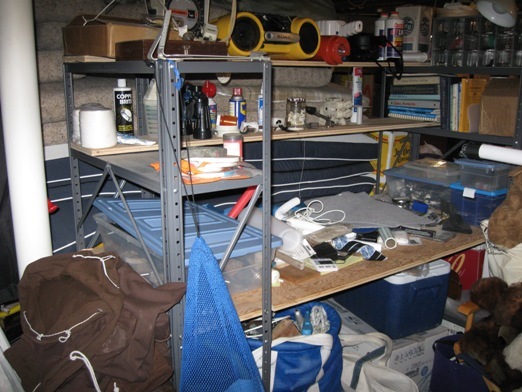 The next stop inventory location is my office - electronics, charts, books, cruising books, manuals, website files, etc. 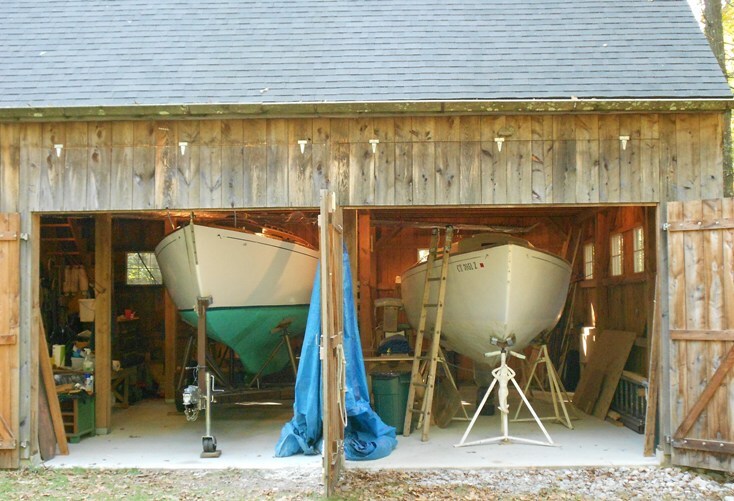 This is pretty crowded too - not as bad as Paul Ingle's sailing office (Seminole) but close. 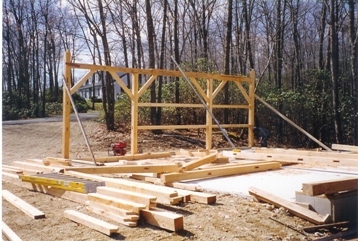 You are planning on building a barn? 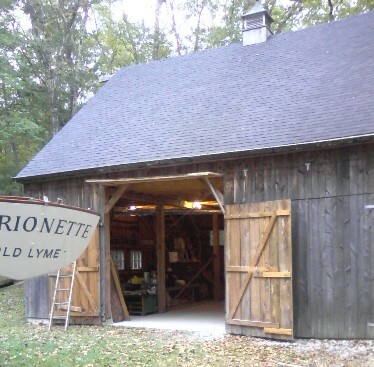 You must have been reading about Marionette's barn? 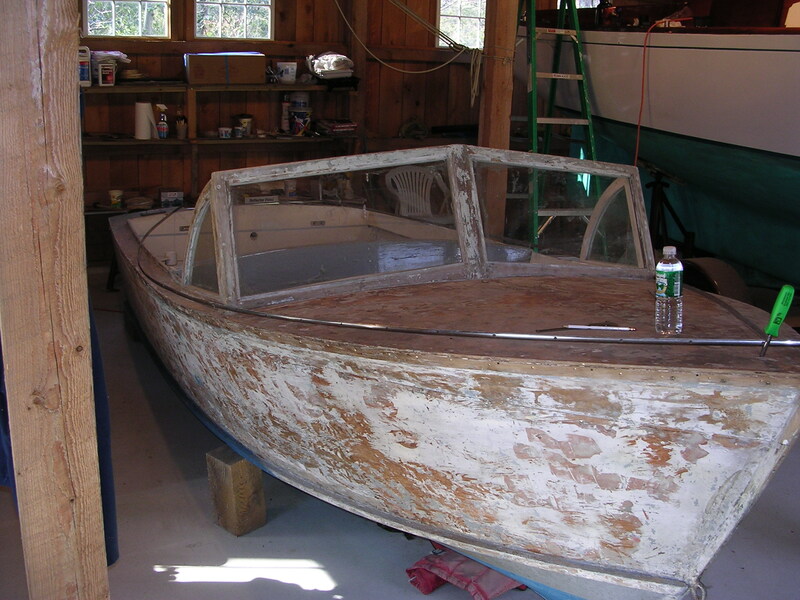 Also a consequence of buying a Dolphin to restore. The story of Marionette's Barn is located in the Stories Section on the website. Here's an unsolicited piece of information re barns you might find useful. 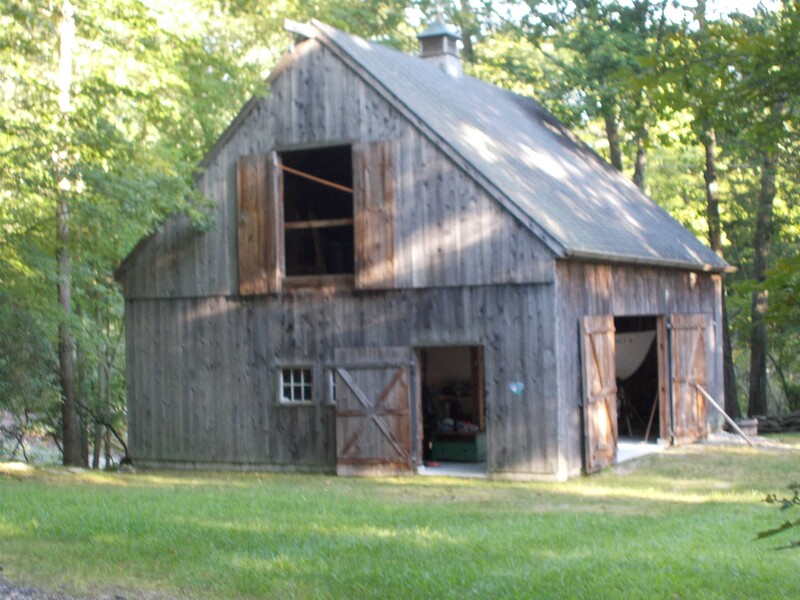 We have a well respected 'barn" building company in Madison, CT. 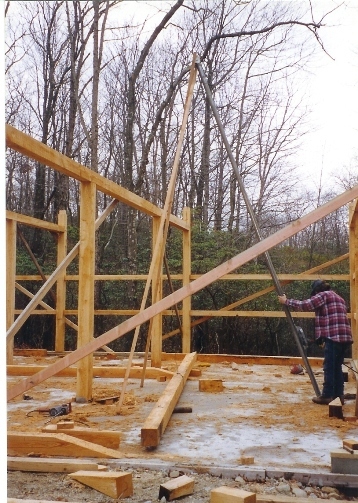 They quoted me $32,500 for my barn - but not a traditional pegged post and beam, one built using steel hangars, and not including site preparation, concrete foundation or electrical. 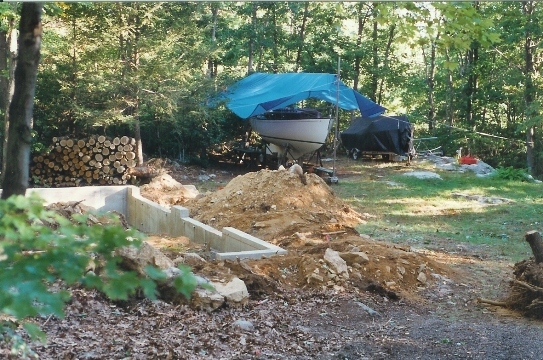 A really good foundation is an important key to a long lasting, and high utility barn. Makes one want to get into the general contracting business. Anyway, the bragging rights are priceless. October 18, 2011. The barn has, finally, been modified so that two Dolphins can winter inside. All it took was a third door on the middle bay, something that was planned for in the beginning, but put off for reasons that in hindsight made no sense. A second Dolphin, Passage, came into the family and has been on what has turned out to be a long term restoration schedule. When this project got going in ernest a few years ago it seemed that Passage should be in the barn for all this work, and so poor Marionette, as the years went by, spent a number of winters out under a tarp. 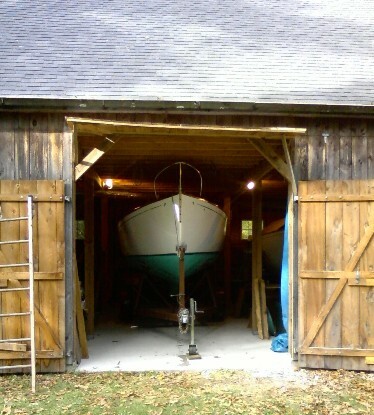 The last 'reason' was that Marionette was going to stay up in Maine for a 'few' years, wintering in a boat yard shed - after two years of trying to pull that plan off, and failing, coupled with last year's very heavy snow on poor Marionette under her tarp, outside her barn it was - NO MORE! Marionette will join Passage in the barn. Barnbuilder John was still in the game and came back after 14 years, put in the horizontal 3rd door, and widened the opening with larger vertical doors. The Designer and the Builder complimented ourselves that this was made easy because it was provided for in the original plan!